As a mom of three school-aged kids, I spend time each evening packing school lunches for them. Sometimes it seems like I'm making the same lunches over and over again. The kids seem to like them, but I wonder if I could take a little more time to make a healthier and more interesting lunch. This week, I had the opportunity to review a new cookbook that focuses just on lunch! What Are You Doing for Lunch? 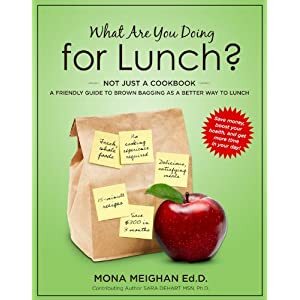 by Mona Meighan doesn't just have some great recipes - it also lays out an argument as to why brown-bagging your lunch is so important! The book has over 70 delicious recipes to prepare in 20 minutes or less. It has cost-savings projections of how much you'll save in a month and in a year. Each recipe includes nutrition facts to help you keep an eye on calories, fat, sugar, and sodium. And there are sample menu of lunches to get you started. Meighan describes several different lunch styles and gives recipes for each style. Need something quick? Try the Grab and Go (and Almost Grab and Go) recipes. Are you someone who likes the same lunches day in and day out, but wants a new twist on them? Then check the Traditionalist recipes. Love spending 20-30 minutes per day to make lunch? Try the Creative recipes. Willing to spend time on the weekends to make lunch? Give the Midday Gourmet recipes a try. The lunch style I found most interesting was the Social Networker style. For this type of lunch, Meighan suggests that a group of co-workers gets together, and each person brings an ingredient for a recipe. The ingredients are mixed together at the workplace to make lunch for all the participants. I thought this was a great idea for a group of people to enjoy making and eating lunch together while saving money and eating healthfully! I had another idea for Social Networker lunches - families could make these lunches together as well. Each child could take on a task that was age-appropriate - older children could cut up vegetables or use the stove to cook items. Younger children could help with mixing or opening packages. Then the family could share a delicious, nutritious lunch together! 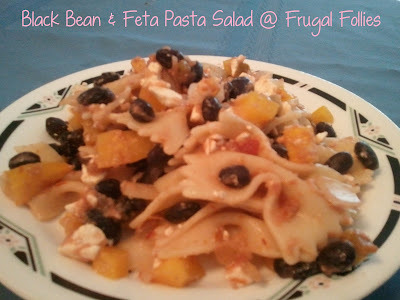 For Frugal Food Thursday this week, I decided to try one of her Social Networker lunches: Pasta Salad with Cheese and Black Beans. I made a few changes to the proportions of the ingredients, though. I had all of the ingredients on hand, purchased on sale with coupons at Publix or at the lowest price available in my area, ALDI. It was fairly easy to make, and very delicious! I really enjoyed my lunch, and I'm sure you'll find lots of great lunch recipes to try in What Are You Doing for Lunch? as well! Person 1: Cook the pasta the night before, rinse with cold water, and refrigerate. Person 2: Combine salsa and black beans in a small bowl, cover, and refrigerate. Person 3: Crumble feta if not already crumbled. Person 5: Bring bread, fruit, soup, or other side dishes. 30 minutes before lunch: Combine all ingredients in a large bowl, add salt and pepper to taste, and cover. Refrigerate for 30 minutes to allow flavors to blend. Yummy. I shared my pretzel twists. Thank you for sharing at the Thursday Favorite Things hop xo P.S. 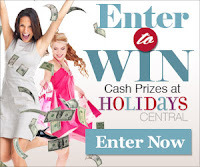 did you enter my latest giveaway? Simple, delicious and healthy. The book sound great. Thanks for sharing it on foodie friday. This looks super good. I am adding black beans to more and more dishes lately. Thanks for sharing at Must Try Monday. Yum! I love pasta salads and adding beans just makes it even better! Thanks for linking up at Friday Food Fight! black beans and pasta are always a good idea :) great source of protein and so comforting.